Chinese tones: Oops, that’s the wrong tone! Think tones don’t matter when speaking Chinese? Wait til you get to China and try to say something. Odds are you’ll draw blank stares and shrugs because no one can understand what you’re saying. Or worse, you might suddenly get insulted, for a seemingly unknown reason! The culprit? Your Chinese tones! I started learning Chinese in middle school, then studied Chinese all through high school and University. My third year of University, I went to live in China. For a year. I was confident I’d be able to speak Chinese with everybody there. I mean I knew tons of vocab. Turns out, I was wrong. but the Chinese won’t think so. Why? Because even if I knew a bunch of words, I didn’t really know how to pronounce them. Back in school, my Chinese teachers understood me… but then they could more or less guess the kind of things I was going to say since they were the ones that’d taught them to me in the first place. That and/or the fact they’d grown accustomed to hearing foreigners speak butcher Chinese words. But in China? No one understood me at first. I had to go back to the basics. “Me want this.” Yeah, that bad. Others, I know, have had similar experiences. On his Sinosplice blog, John mentions “the horrifying discovery that no one in China understood my Chinese”. This speaks volumes about traditional western teaching methods (but that’s another story) but also shows the importance of pronunciation (pinyin) and above all, of using Chinese tones well. 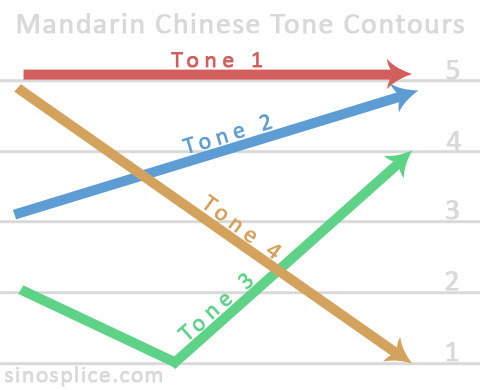 Tones are particularly important in Chinese because they’re key to speaking Chinese properly. Yet they’re so very easy for us to overlook (at first) because we come from non-tonal languages. Now, if you already speak Cantonese, a massively tonal language (7 tones! ), Chinese tones are just child’s play for you. Good for you. Ok, let’s backtrack a bit. What are Chinese tones? Chinese Tones are represented by little lines above the letters, kind of like accents in other languages. If you’ve taken Spanish or French, you know what we mean: this “à” for instance has an accent on it. Tones tell you how to accentuate the sound. In Chinese, each syllable has its own tone. The name Beijing, for instance, has two different tones. And here’s how you’re supposed to pronounce each tone. First tones are high and level. They sound high and flat, like the second syllable in “ta-daa! Third tones start low, dip and then go back up. Think of saying “no? !” like you can’t believe what the person is saying. I love 3rd tones. They’re often the easiest to recognize because of the way the voice goes up and down. Update: that being said, third tones are a little tricky. They like to change forms and sound kind of like second tones when in the middle of a bunch of other tones. Fourth tones start high and fall low. They’re called falling tones. I like to think of the 4th tone as being the mean counterpart to the 2nd tone. The 4th is harsh and bold. The 2nd tone goes up and is hopeful. Yes, I make up little stories about tones. You should too. Lastly, fifth tones are neutral. Good news: no effort needed to learn those! Remind me again, why are tones so important? The Chinese language is composed of characters; there are a limited number of sounds (called pinyin) used to pronounce these characters.In fact, there are a lot more characters than there are sounds. So, one key thing to know about Chinese is that many words have very similar pronunciations. Similar to the point of even often being the same. In that case, the only thing that allows you to tell two words apart (when you hear them pronounced; in writing, you simply have to look at the two different characters to tell them apart) is the tone with which they are pronounced. 糖 means sugar. It’s pronounced táng. 汤 means soup. It’s also pronounced tāng, but with a different tone. So, as you can figure, learning how to pronounce tones correctly is a big part of learning how to speak Chinese! And it’s usually considered one of the biggest challenges in learning Chinese. It does take work to get them right. Good news, tho! You’ll get there. As always, don’t be afraid to make mistakes; this is the only way you’ll learn. 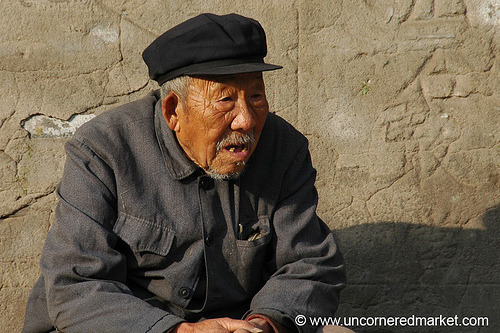 Practice listening to spoken Chinese and get accustomed to how tones sound. Chat away in Chinese and get your tones wrong. It’s ok. Eventually you’ll be understood. Like we said, odds are you’re not going to end up insulting people unintentionally. Next time, we’ll be talking about methods to improve your tones speaking and tone comprehension. People might think you’re crazy but it’ll work! What’s worse: getting insulted or people thinking you’re crazy? I think the most important thing to remember is that your fluency in Chinese is not determined by how fast you can speak, but by your tones, pronunciation, and grammar. I constantly have to remind myself to slow down and focus on the tones and at the very least get the correct tones for the most important words in the sentence. Pingback: Ask Nincha: Tone sandhi - Why are there tone changes in Chinese?